You and I could be having a better year. Sure, maybe we feel like we’re getting a little busier, but doesn’t it feel like there might be just a little more opportunity out there for the taking? Or maybe we feel like we’re just “spinning our wheels” sometimes. It isn’t right to blame circumstances – we have nobody to blame but ourselves, if we’re not putting ourselves in the position to maximize opportunity. My plan is to block some of the distractions that are coming my way and to tackle more of my goals. I’ve been doing a lot of thinking about the best tactics I can use to put my strategy into action. Email is a wonderful tool for communication – it is also a major distraction for me sometimes. You know what I’m talking about – the phone vibrates with an email, and like “Pavlov’s dog,” we react to it. Sometimes the “very important” message I receive isn’t so important all – it can wait and it should wait! I’m trying very hard to make a conscious effort to check certain email addresses a few times each day and others a few times a week. Most of the messages are important to some degree or another (except for the spam), but having multiple accounts allows me to prioritize and force myself to have a little more discipline – one address for less urgent notifications, one for personal messages and another for urgent business. And when it comes to communication, phone calls take top priority, followed by email messages. While I’m not blocking messages, I am “blocking” out the time when I will take a look at them. You may be doing the very same thing, or your strategy may be very different from mine. The point is that you owe it to yourself to have a strategy, so that you may have a way to take charge of your time. My wife filled me in on a strategy she embraced as a stay at home mom, several years ago. She comes up with a list of three important tasks to complete each day. The list changes each day with priorities, with some tasks moving to a list for the following day. I like that strategy! Granted, I’ve been making daily lists for a long time, but maybe the simple remedy for making them more effective is for the lists to be a little shorter and include only the action items that will “pack a punch,” providing more impact. I’ve also tried to get myself away from a “punch list” mentality and into more of an “idea list” mentality. Earlier this month when I attended WordCamp Atlanta, I heard John Saddington talk about how he uses an Action Journal to capture ideas and develop action steps. I’ve carried notepads around with me for a long time, but I like the way the Action Journal is designed. So, I hunted around for them online and ordered a couple. While the shipping charge was almost as much as one of the books, I believe it might have been well worth the investment. Since receiving my Action Journal, I’ve found it to be very helpful. 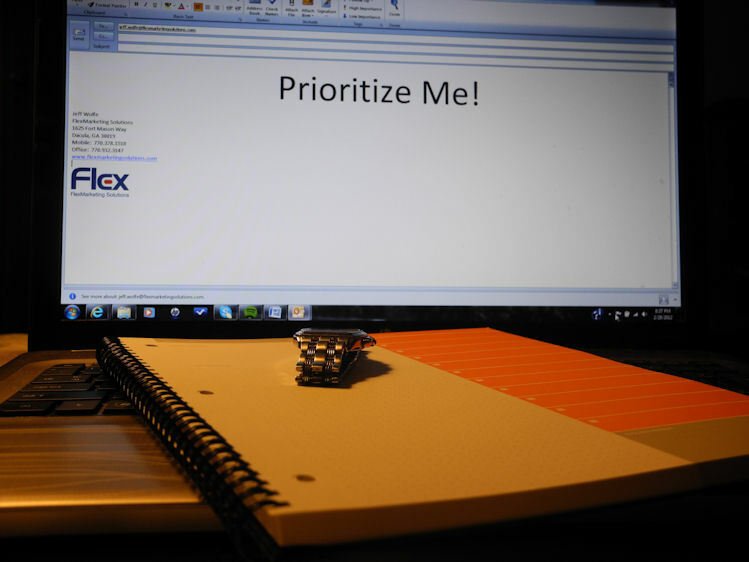 Yes I’ve used it for making lists – more importantly, I have used it for capturing ideas and prioritizing ideas that are more likely to turn into powerful results. Has my conscious effort led to greater success, or has it been a waste of time? It’s too soon to tell – but success is up to me. “Block and Tackle” has worked less than perfectly for me. There are times when I revert back to the “Pavlov’s dog” mentality of checking messages at inconvenient times. There are also times when I leave the Action Journal on the sidelines. There isn’t anything overly clever or remotely revolutionary about my approach – the point is, “Block and Tackle” has been a pursuit and a top priority. I believe the main thing is that find what works best for each of us, stick with it, and then put our plans into action.